Once again I’m posting Writer’s Quote Wednesday entry on Thursday – don’t forget to check out this event on Silver Threading! Anais Nin is a French writer, who was most famous for her journals. She released a series of diaries, telling readers about her life from being 28 years old up until 71, describing her voyage of self-discovery. I guess, you could say she was an original blogger, couldn’t you? On my blog, I write a lot about different places worth visiting, but over the years on the move I’ve collected so many interesting stories about people I met, things that happened, interesting traditions I experienced, that I felt like I wanted to tell you more. Maybe I just want to relive those moment as well? 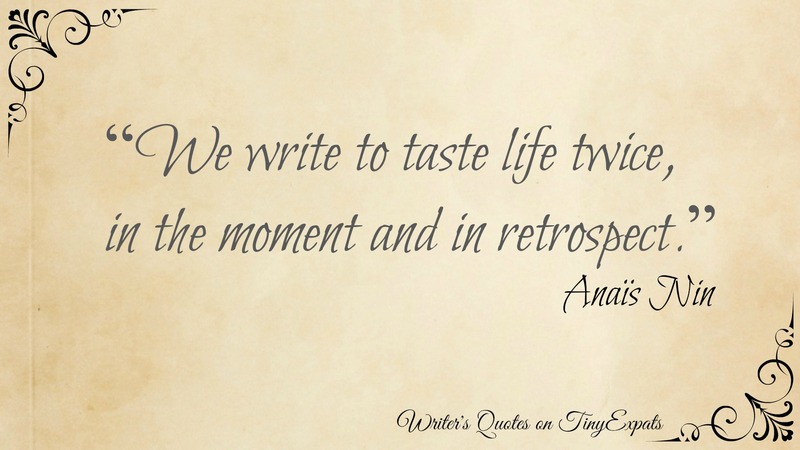 I relate to this quote, too: I’d never thought of writing as a way to relive an experience, but it is, isn’t it? I do find that I am tempted to smooth off the rough edges when I recount an event, though. That quote is so true. We write, or blog, to share with others but the other half is to relive the experience as we write and then again to be read in the future.